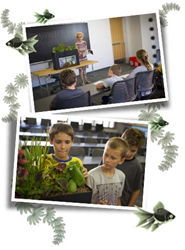 Aquaponics is growing food and growing minds through hands-on learning in the classroom. AquaSprout Gardens grow fish and plants together, mimicking nature. Aquaponics is the combination of aquaculture - growing fish and hydroponics - growing plants. These systems have been around for thousands of years, and have recently experienced a surge of popularity as more people seek to grow their own food in a sustainable way. All that is needed to get started with the AquaSprouts Garden is a 10-gallon aquarium, a few plants, and the fish of one’s choice. Aquaponics can be scaled from the tabletop all the way to community farms that feed many people around the world. "Along with the sciences, Aquaponics creates opportunity for other learning moments centered around critical topics such as nutrition, food security, sustainable agriculture, and feeding a growing world population", says Tawnya Sawyer co-owner of The Aquaponic Source. "Aquaponics is the ultimate green technology, we can't eat data or money or goods. We need people that know how to grow food, and what better place to start than the classroom."